Today's digital circuitry is capable of truly remarkable rednitions of the clarity and emotional content of music. And nowhere is this more clearly seen than in the latest Reference CD players from Marantz. At the very top of the Reference range stands the Marantz CD-7, a multi-bit design with unsurpassed rhythmic intensity an a quality of dynamics and pace more usually associated with the recording studio. At its heart is the legendary 'Double Crown' digital-to-analogue converter (DAC) and a new and specially tailored Digital Signal Processing (DSP) chip, the MZ777f. Together they form an unbeatable combination, setting a new level in CD performance. What's more, a digital input makes the high end DAC and DSP accessible to other digital sources. The top-flight reproduction of the Marantz CD-7 can be extended to DAT, say, for an instant and spectacular upgrade in performance. In the past, lack of finesse in filtering the singal's spurious images and unwanted noise compromised even technologically advanced multi-bit DACs by introducing 'ringing' distortion, without sophisticated filtering even the Double Crown would be humbled. But for the Marantz CD-7 Marantz has stepped right into the digital domain and by usiing Digital Signal Processing, developed a brand new filter which acts with extreme subtlely and precision before the datastream is converted to analogue. Dubbed the Linear Music Filter (LMF), the new digital design makes possible extraordinary accuracy of reproduction by responding to instructions encoded within the MZ777f DSP chipset. It can compensate for the characteristics of analogue filters to ensure a flat frequency response and zero phase distortion in the audio band, while its four times oversampling shifts spurious images and noise far outside our range of hearing. It's a much advanced manifestation of the standard 'FIR' digital filter used in many of today's less exalted applications. It remains true that the original FIR's audio characteristics are preferred by music lovers, on the downside, it introduces 'pre-' and 'after ringing' distortion when it fails to respond with sufficient precision to amplitude impulses. Its variant, the more precise-acting 'Short FIR', shows less attenuation above 20kHz whilst retaining the same sonic character. For the LMF, however, Marantz created a filter preserving that sonic character, but whose impulse response (behaviour in time) is so precise as to significantly cut down after and especially pre-ringing distortion, so that reproduced music retains all the attack and dynamsim of a live performance. In tandem with this, a gentle-acting 3rd order bessel analogue filter in the Marantz CD-7 offers optimum impulse response and lowest phase distortion after D/A conversion. The DSP chip incorporates other advantages too. Among them is Soft-Mute, to eliminate signal noise 'click' when activating stop and pause controls. Another is automatic selection of the appropriate de-emphasis filter for CD and DAT applications when detecting 44.1Khz or 48kHz sampling frequencues. Plus, digitally attenuating the signal by -12dB makes it possible to clearly identify track content during high speed reverse or forward search. In lesser multi-bit players, with l ower grade digital-to-analogue conversion systems, 'bit weighting errors' accumulate and ultimately destroy linearity and musical accuracy. 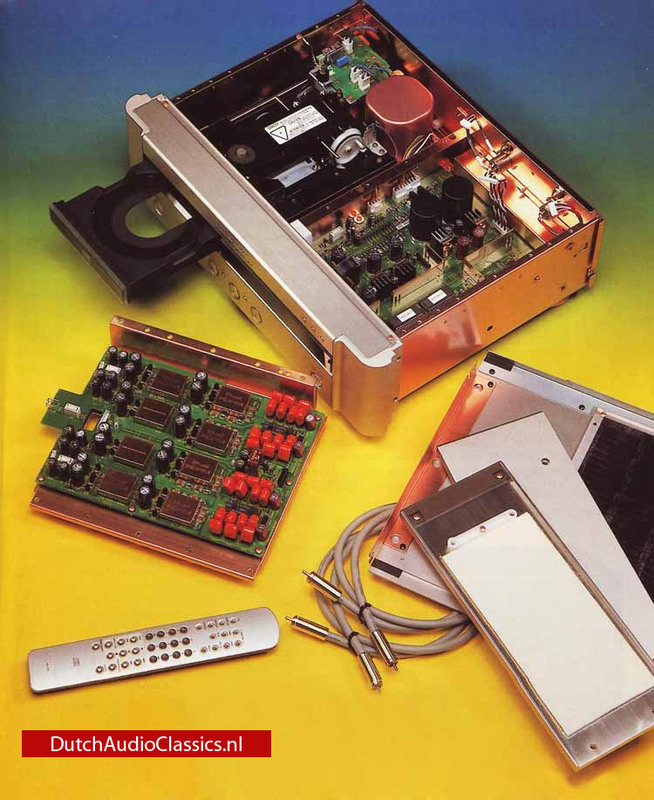 When designing the Marantz CD-7, however, Marantz insisted on near-zero tolerances during the DACs manufacture: so, linearity is preserved and the analogue output level tracks the digital input code exactly. Even low level signals are delivered with pin-sharp clarity, and listening ambience is acutely heightened. Beyond D/A conversion, the Marantz CD-7 is built to rigorous standards, including solid metal casing and rigid copper chassis. Internally, non-magnetic copper shielding protects the most vulnerable parts of the siganl path from stray electro-magnetic radiation, while op amps are eschewed in favour of discrete circuit components. Analogue, ditigal, control and power supply blocks are independent, each fed by a stabilised power suuply. An ultra-low-noise ring core toroidal transformer maintains tonal and image accuracy, and the player's Philips CDM12 'Industrial' laser assembly is fully floating, with rigid, anti-vibration meal chassis, to protect CD tracking from vibration. Finally, at both balanced and unbalanced output stages, copper screened Hyper Dynamic Amplifier Modules (HDAM) retain waveforms transient character to ensure that reproduced music has all the speed and impact of studio sound.